On March 19, 2012, I was talking to the Lord about stuff going on in my life. 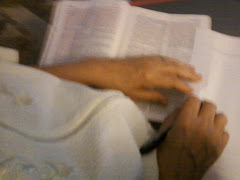 I had just written out my devotions from the book of Amos, chapters 1-2. I was thinking about how Amos was just a shepherd when God called him to be a prophet and to give out his messages. I thought about all the prophets from the Old and New Testaments who had to give out difficult messages, confronting sin, calling for repentance, and often warning of judgment. I thought about the calling of God on my life to share what he teaches me each day from his word, in all practicality in applying Biblical truth to today’s world and church, and to my own personal life, too.